This is one of the easiest recipes you will make! Shortbread is buttery, rich and savory. Butter + Sugar + Flour = L.O.V.E. You can easily make additions to it to suit your taste buds. 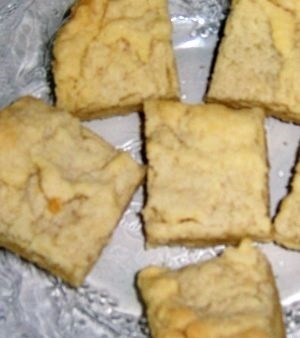 Below is an original recipe and one for a mocha chip shortbread. If you prefer a fruity flavor, you can make a simple icing out of powdered sugar and lemon juice and call it lemonade shortbread! Lemonade icing recipe is also listed below. If butter is not soft, place it in the microwave in a glass bowl for 15-20 seconds. Line a 9x13 baking dish with no-stick foil. With mixer, cream butter and sugar. Spread mixture into baking dish. It may not cover the entire dish. Bake for 30 minutes or until the center is cooked through. Cool, remove from pan by lifting up foil and slice into inch squares. Add flour then coffee and chips and mix until combined. Add lemon juice a teaspoon at a time to powdered sugar until you have a frosting like consistency. Spread over shortbread and allow it to cool. Icing will harden as it cools.